There's not much better than rifling through the stacks at a charity shop. I managed to leave the house at 9am this morning so I was the first person to get to the shops. It was a lovely warm, sunny day. The shops were really quiet and it was incredible to just take my time without being jostled around by other shoppers. 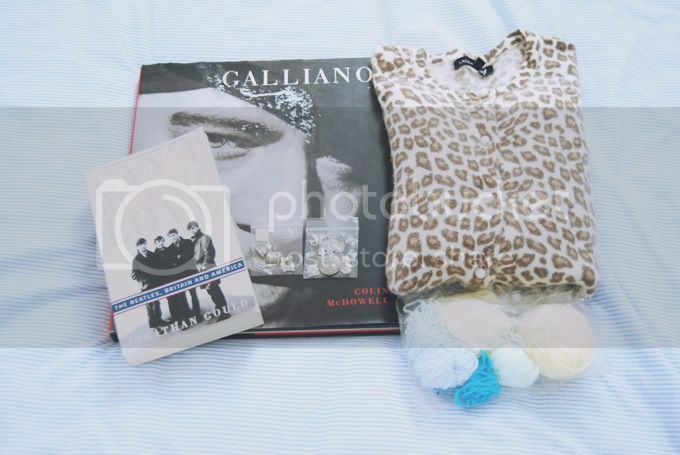 These are the goodies I picked up: A John Galliano and a Beatles book, some vintage charms, a Laura Ashley leopard print cardigan and some wool for an upcoming tutorial. There were loads of these charms with different themes. I picked up the sewing and Christmas themed ones though I wish I had got the school-themed ones too. Hopefully they'll be there next week. I think my favourite part of charity shopping isn't so much the stuff you buy as much as the amazing stuff you see that you don't actually want to buy. I never had a Spice Girl doll as a kid, which is odd as I loved the Spice Girls. Below them, you can see a glimpse of the Harry Potter audiotapes. I love pigs so I thought these mugs were super cute. I don't drink hot drinks though, so I have no need for mugs. A whole bunch of vintage zips. I know where to go when I start sewing again! I have no idea what this is but I like it a lot! Just look at the awesome print! I would love spice girl dolls! I love those charmsss!!! great findings! Ah, I see that now! Hmmm, I wish I'd bought it! These are incredible. TELL ME you got the spice girl doll?! Afraid not, Amber Rose. As much as I love them, what would I do with them?